In the latest goodwill gesture toward Beijing, Pope Francis has called on seven Chinese bishops, whose pastoral duties were made public on Sunday, to show "respect and loyalty to civil authorities" while adhering to their faith. 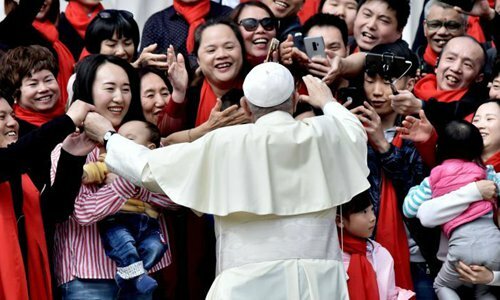 "As members of the Chinese people, they are obliged to show respect and loyalty to the civil authorities," Pope was quoted as saying in an article published by Vatican newspaper Osservatore Romano on Sunday. The article also revealed the diocesan pastoral tasks of the seven bishops. The announcement shows that the Vatican is calling on all the clergy and the faithful, including those who regard themselves as from the "underground churches," to be in solidarity and to support the bishops' pastoral duties, Wang Meixiu, a research fellow at the Chinese Academy of Social Sciences, told the Global Times on Sunday. The announcement comes after China acknowledged two underground bishops after a landmark bishop appointment agreement signed between China and the Vatican in September 2018. On Thursday, an inauguration ceremony for Jin Lugang as coadjutor bishop for the diocese of Nanyang, Central China's Henan Province was held. The ceremony is the first of its kind for a bishop from "underground churches" after the September agreement. The announcement is a goodwill gesture from the Holy See in response to the recognition of the two underground bishops, Wang said. The Holy See "continues to be committed to continuing the path of dialogue" to gradually address the existing problems with understanding and patience, beginning with the civil recognition of the "non-official" clergy, said the article. The "non-official" clergy need to follow religious regulations in China to gain the civil government's recognition, and fulfilling their social responsibility is also an important reference for the status, clergy in China previously told the Global Times. The Osservatore Romano is a daily newspaper that often carries the Pope's discourses and reports on the activities of the Holy See, as well as on the main events of the Church.